Agenda: Renee Marino will give a presentation titled Valuation of Intangibles: Exploring the Reasons Why a Business Is Worth More than the Market Value of Its Tangible Assets. Renee will begin with the brief introduction of a framework for valuing intangibles and then focus on several examples. Examples will span pre-revenue to end-of-life assets and were prepared for gift and estate tax, financial reporting, transaction support, and litigation purposes. They will also illustrate quantitative methods such as estimating an advertising diffusion model, customer portfolio living analyses, and the use of customer surveys and point-of-sale data. Some of the discussion will draw on concepts presented in the book she co-authored, The Physics of Brand, and insights from her discussions with global companies as to how they view valuation in managing intangible assets. Welcome, Corey O’Connell! Corey’s application for membership was approved by vote at our December 20th meeting. Corey is a CPA with the ABV designation and has been doing business valuation work since 2012. Corey’s work is split between business valuation and divorce litigation support. The MABVP is honored to recognize Mr. Tom Helling as our most recent honorary lifetime member. Thank you, Tom for your years of service and support to our organization and industry! Tom was presented with a plaque in honor of this award. Check out the photo below (also including the festive “ugly sweaters” from the Valuation Contest – nicely done, Josh!). 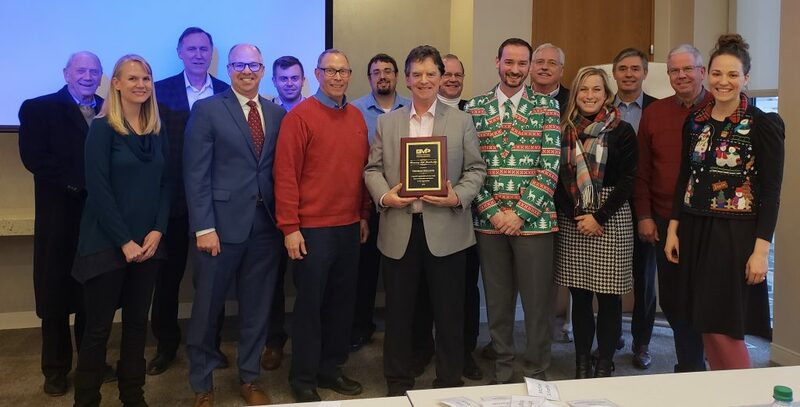 Jeffrey Wright of Corporate Finance Associates hosted our Annual Valuation Contest and presented two sales, each featuring a high customer concentration. Congratulations to our winners: Jim Goff, Bud Sandberg, Madeline Strachota, and Jennifer Schiefert! Also, congratulations to the winner of the Ugly Sweater contest, Joshua Johnson! Thank you to all you participated in the contests. We were saddened by the news of Benjamin Heidebrecht’s passing on December 17, 2018. Benjamin was the son of MABVP Board Member and former President, John Heidebrecht. In support of John and his family and in memory of his son, the MABVP has made a donation to the Chaska Humane Society, one of Benjamin’s favorite organizations.